I love the fact that the area around Wrigley Field in Chicago, is aptly named ‘Wrigleyville.’ I think Cincinnati needs to do the same for the Reds. As you all should know, I am a total Reds junkie and a baseball fanatic. One of my goals in life is to visit every single MLB Stadium. So, of course, we were going to be in Chicago which meant visiting Wrigley Field. Bummer for me, the Reds weren’t in town. Instead we saw the Cubs play the Astros. The stadium was like a step back in time and it was great to see it. We also witnessed a pretty crazy storm while we were there which added extra pleasure. And then, there was the food. I do not eat hot dogs at all. They are one of those food items that totally gross me out – even just the smell of them. So, I did not visit Chicago and get a dog however, both Mommy and Taylor did (see photo below). When we got to Wrigley, I was hungry and looking for something good. The main food choices are all on the lower level and our seats were pretty high. After walking around for a bit, I needed to make a choice. I wanted to try something different and while ordering the dogs, I also saw they offered Tater Tots in Cheese. I love me some Tater Tots so I opted for these suckers. My bowl/plate arrived very hot to the touch and was loaded with tots and a ton of cheese sauce. After making our way back to our seats, I dug in. The first thing I noticed was the fact that there was entirely way too much cheese sauce. It simply drowned the tots. This is really a bummer because the cheese sauce in moderation, was good. Yes, it was just your basic out-of-the-can cheese sauce, but the taste was creamy, cheesy and smooth. I enjoyed it in moderation and may have had a bite or two at the end of only cheese. Grandma shares it all here. As for the tots, they were your basic tater tots – simply amazing. I have an odd love for tater tots and often times will not purchase them at the grocery because I just want to eat them all. While the tots were not super crispy, they were fully cooked and warm inside. The consistency was the familiar diced potatoes and they tasted of any other tots. I really enjoyed the bites of tots that I got with some cheese sauce. Some of the bites were too much cheese and these bites did not allow the tots to be a player in this game for two. And it was not time to say Bye, Bye, Bye. In order to eat the tots & cheese, a fork was required. Without it, this would have been a mess. 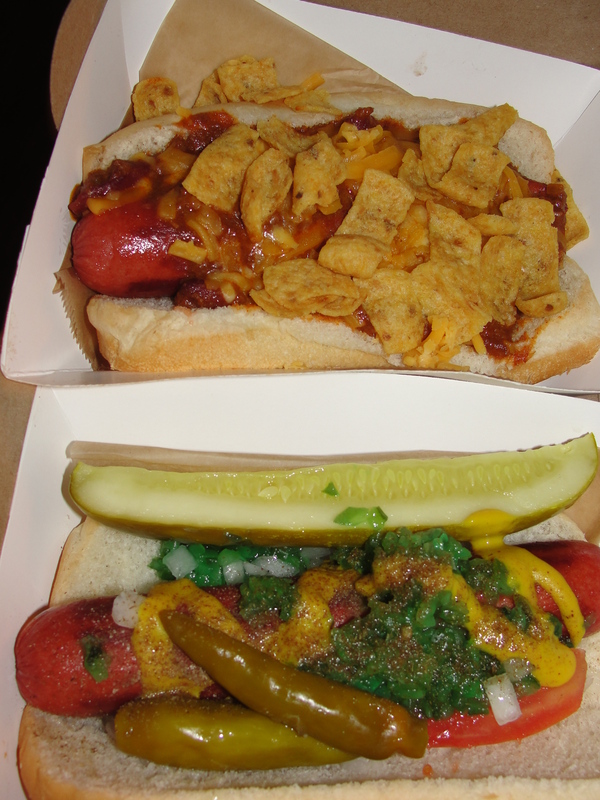 While this is not the best food to eat at the ballpark, it was a very tasty treat that I would order again. 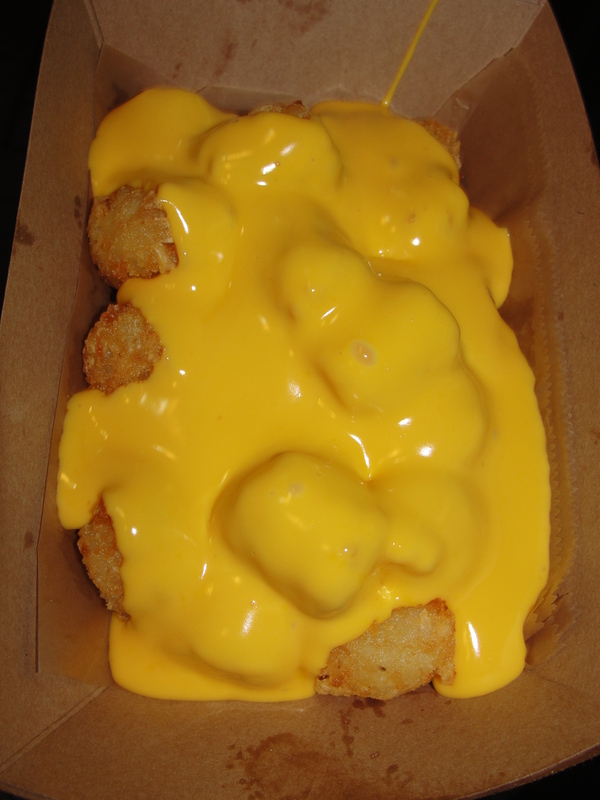 Those sweet tots mixed with ample amounts of cheese, created one tasty end product. While at Wrigley, I also got my usual Soft Pretzel – it was good, and some Peanuts – also good. Tater Tots in Cheese may not scream Chicago but for me, on a Summer Afternoon in July, these hit the spot.